If, like many of us, you can barely function without your morning cup, then a coffee pod machine is the clear choice. Sure, they might not have the undeniable Sunday morning feel of a cafetière or the nostalgic charm of the stovetop moka pot, but these mighty machines more than make up for it. These machines are for those who look for a blend of sophistication, speed, and ease of use in the making of their morning cup. But for those who like a little more influence over the consistency of their coffee, a quick peek at our best espresso machines would do no harm. So, how do you go about choosing which coffee pod machine is right for you? Not to worry, espresso aficionados and latte lovers — we’ve got you covered. Our list of the very best coffee makers on the market includes something for sippers of all stripes, whether you like it short and strong or deliciously frothy. The first thing to consider when looking for your new capsule coffee machine is that you’ll have to choose sides, not necessarily when it comes to the make of your machine, but to the type of pod it takes: the big three are Nespresso, Tassimo, and Dolce Gusto, so if you’re particular about your blends, be sure to check the compatibility of your machine with the different brands first. If you like your coffee on the foamy side, look for a model with milk frother included, for cafe-perfect cappuccinos at home. Another matter of taste is the design, which ranges in this list from the delightfully retro to the slightly space-age, via more standard models built to blend in with your existing appliances. Unlike more manual systems, this magic little machine delivers your morning latte straight to the cup (or glass, if you’re a purist), no add-on milk frother required. It also has the capacity to store personalised drink options, remembering the exact amount of coffee and milk required for your favourite beverage — which is more than we can do in the early hours of the morning. 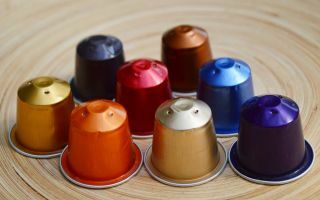 What sets it apart from many other Nespresso machines, though, is its sheer number of automatic options, with six buttons (for ristretto, cappuccino, latte, espresso, long, and hot milk) trumping the usual two. If you have a household where coffee preferences vary and instant granules just don't cut it, the De’Longhi Nespresso Lattissima Touch will have you covered. This joyful little gadget refuses to restrict itself — as well as coffees from brands such as Costa, Kenco and Carte Noir, it can also make creamy hot chocolates and tempting teas, thanks to its compatibility with the mind-boggling array of Tassimo capsules on the market. Its futuristic-sounding ‘intelibrew’ system uses barcode technology to identify what capsule you’ve popped in, and how best to make it, so no matter your hot-drink hankerings, you can rest assured you’ll be well catered for. This is the best coffee pod machine for anyone wanting a coffee device where they can just throw in the capsule and leave the technology to do the hard work. And with an impressively short pre-heat time, you won’t have to wait long to be indulged, either. Following in the footsteps of its culinary cousin, the oh-so-enviable KitchenAid mixer, this vintage-look coffee machine is a must-have for those of a nostalgic disposition. Its unmistakable curves and sleek hardware come at a price (it’s the dearest on our list) but as an investment piece combining form and function, it’s second to none. It might feel as if choosing from the range of sumptuous shades, including the country kitchen-friendly Almond Cream, the 50s-diner Candy Apple Red, and the lustrous Medallion Silver, is the exciting part — but the KitchenAid is not just a thing of beauty. With six pre-programmed cup sizes, a sizeable 1.4L water tank, and a heat-up time of under 30 seconds, it’s also a sure bet for a perfect cup of coffee. For anyone who as already acquired a KitchenAid appliance and gets along with it, the chances are you'll love the Artisan Nespresso Coffee Machine too. This bijou machine has a small footprint, meaning it won’t take up much space on your worktop; but what it lacks in size, it more than makes up for in functionality. With the inclusion of a slightly bonkers Bluetooth feature that means you can schedule a drink, or even brew remotely, it’s the most high-tech option on our list. But when the Prodigio takes a mere 25 seconds to fully heat up, there’s really no need (unless it’s one of those days where an extra 25 seconds in bed will make all the difference, in which case, go right ahead). It also packs in 19 bars of pressure — good news for ristretto-lovers, and further proof that good things come in small packages. While the space-age design of this little egg-shaped oddity might look like something out of a science fiction film, in reality it couldn’t be simpler to use. It quickly heats to the optimal temperature for your chosen cup — anything from an espresso to a hot chocolate via that coffee-shop favourite, the chai tea latte — as selected on the foolproof ‘hot to cold’ dial. Unlike many other capsule coffee makers, the Jovia has no automatic shut-off, so a watchful eye is required for the perfect length of brew, but with its super-quick heating time, this is a small price to pay for such a good-value system. Plus, this machine is supremely simple to clean, meaning that even in the event of accidental overflow, the mess is easily dealt with. If the KitchenAid is the aspirational statement piece for the vintage set, then this Nescafé Dolce Gusto Stelia is surely the one for those with more modernist leanings. The Stelia ‘Touch to Create’ is a wonder to behold, looking rather more like a robotic assistant than a coffee maker. Disappointingly, it is just a coffee maker, but it’s a very good one indeed. The machine’s curious-looking ‘head’ is actually a pod input with automatic closure, and — perhaps the most impressive bit, and certainly the most fun — an intuitive HMI interface for selecting the finer details of your coffee. This clever little maker also knows to switch itself off automatically after a few minutes, meaning superior power-saving as well as peace of mind. The only problem? The design doesn’t allow for tall latte glasses.